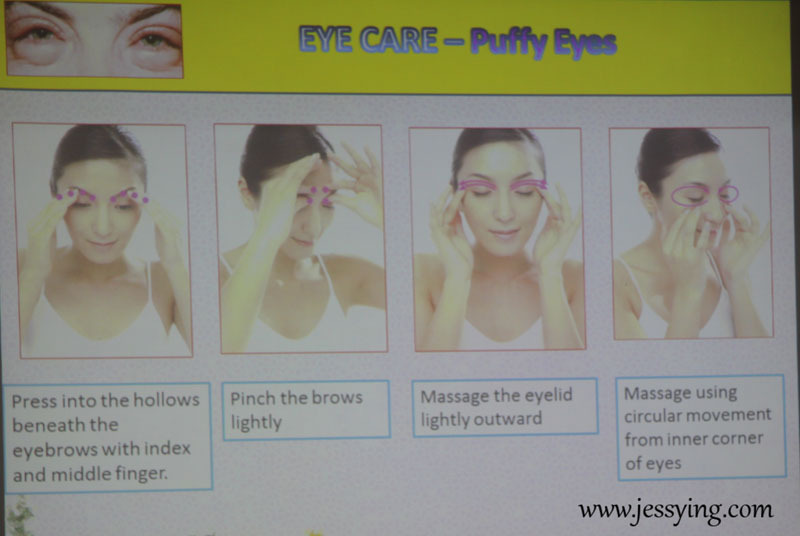 Let's be honest, how many of us really do eye spa at home or salon? 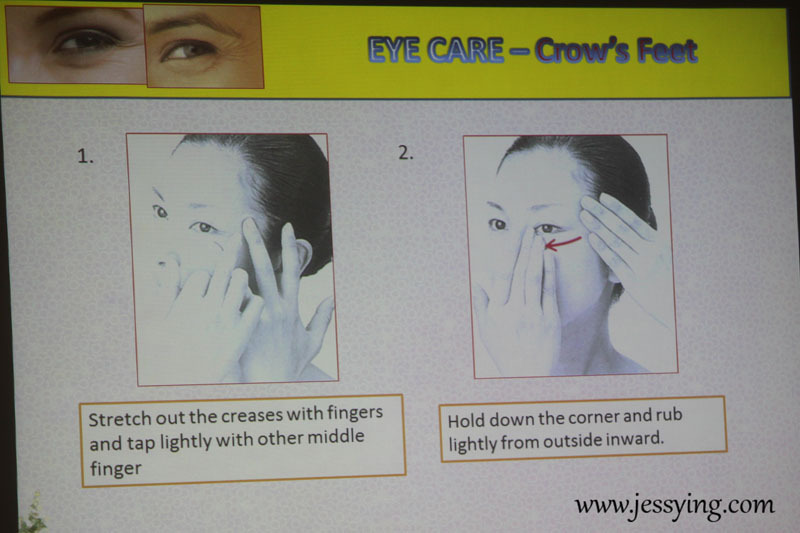 We seem to focus so much on our face that we actually miss taking care of our eyes eventhough daily we face the computer/tv for more than 1o hours a day! And do you girls know that our eyes area & laughing lines are often the first to show the sign of aging. Yes, aging ... fine lines! Well recently Melvita introduced a concept of DIY Eye Spa at home, it is pretty simple to practise this at home or even at the office to pamper our dear eyes. 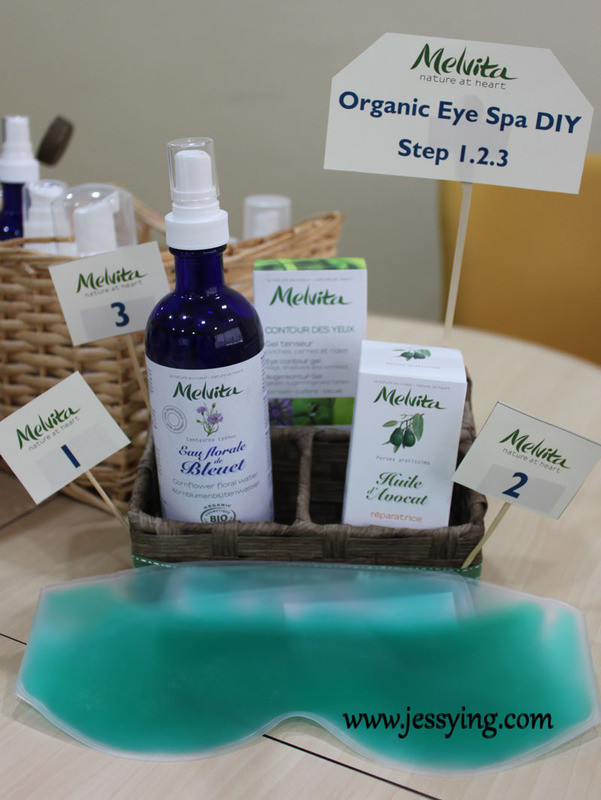 It's just a simple 3 steps with 3 Melvita's products for a DIY Eye Spa at Home . Among so many types of Floral Water Melvita offered, only Cornflower Water can be apply on our eyes. Cornflower Water is extracted by instillation of organic cornflowers is effective as an eye treatment. 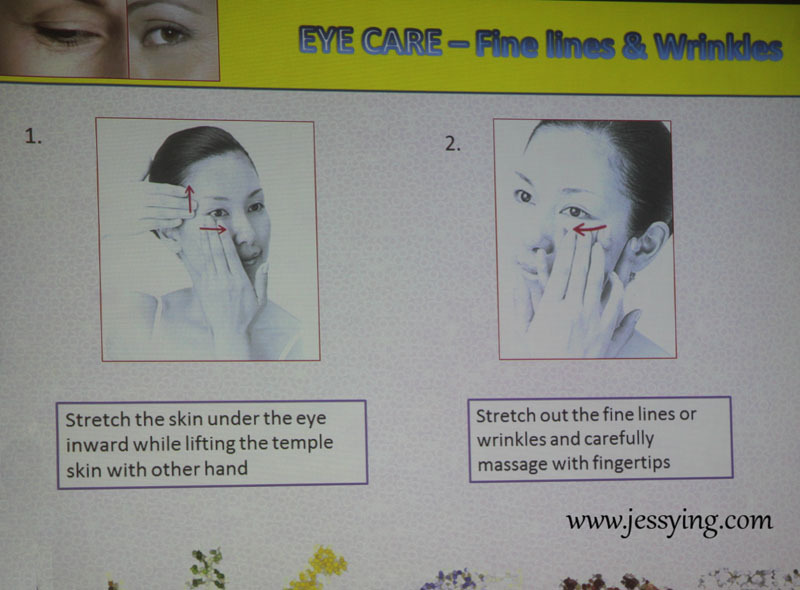 It can be used to reduce fine lines and rejuvenating skin around eyes, and helps to soothe tired eyes and eye sore cause by long period of work before computer screen and reading. 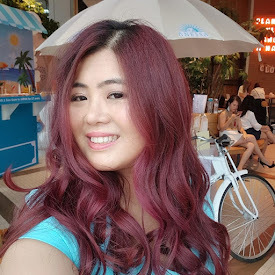 You might be thinking in your head, am I crazy to ask you to apply Avocado oil around eyes area, because that will cause oil seed right? Well only mineral oils and other non-natural fats will cause clogged pores causing fat particles around the eyes which is also know as oil seed. 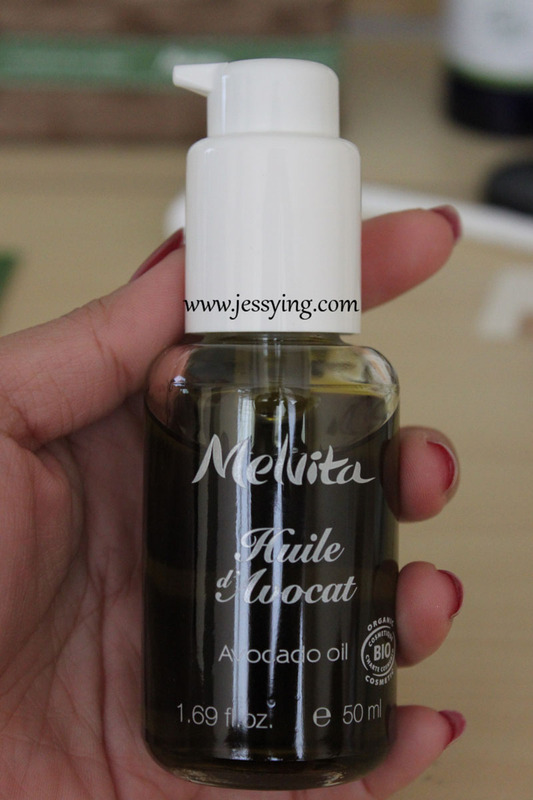 Melvita Avocado Oil, a 100% organic Avocado Oil can be truly absorbed by our skin because of its pureness and mild texture. I was reluctant to apply any type of oil at my eyes areas at first but after being convinced I have tried applying Avocado oil not only all over my face but at around my eyes areas and I gotta say that I'm loving it so far because it is light and absorb so well. 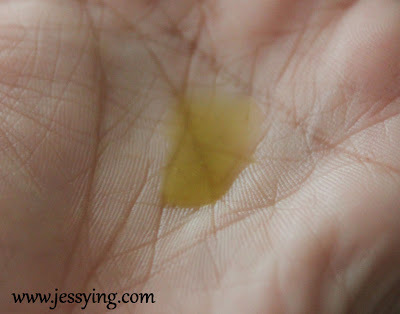 And there is no such thing like oil seed at all ! Melvita Eye Contour Gel targets at 4 major eye problems - dark eye circles,eye bags, puffiness and fine lines. Itconsists of cornflower, chamomile, neroli floral waters ans other organic ingredients, it is target to lighten stubborn dark circles and fine lines, reduce puffiness and aso helps to reduce the occurence of eye bags and signs of fatigue. STEP 1 : Place the Eye Spa Mask in the fridge (not freezer!) to make it cold. 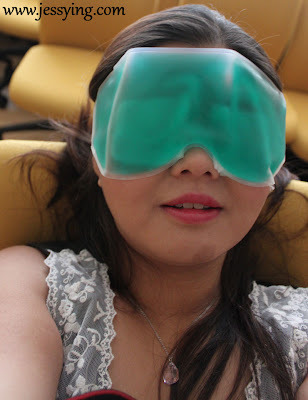 Soak cotton pad with Melvita Cornflower Floral Water as an emergency rescue eye mask and place it on both eyes. Then put on the eye mask for 5 mins. The ice cool sensation helps rejuvenate and brighten the eyes immediately. 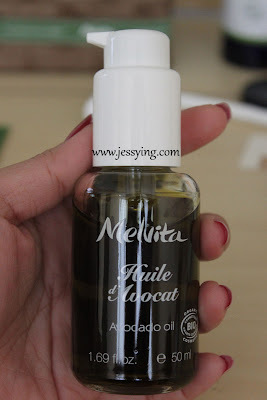 STEP 2 : Gently pat the Melvita Avocado Oil (YES AVOCADO OIL), a 100% pure organic oil as the antioxidant essence in order to smoothen wrinkles and dry lines. STEP 3 : Apply Melvita Eye Contour Gel to effectively remove dark circles. p/s: Will post more massage techniques if you girls are interested to find out. Joy of putting on the eye mask! 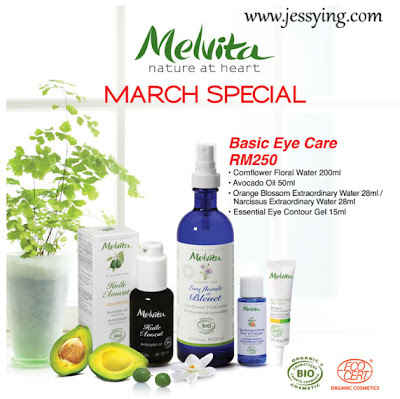 Oh good news, Melvita is currently having promotion for the month of March where this basic eye care set is seling at RM250 only. Do check them out at the store if you are interested to try.